The winning odds in craps can be good; however, you have to know what numbers to bet on and where. The diagram below shows you what the chances are of rolling one particular number from 2 to 12. Ah, does the phrase "lucky seven" make more sense now? It's the number that has the highest chance of coming up on a roll. The craps odds aren't a big mystery, and anyone can master the supposed enigma. Analysing the above dice chart, it is clear that you have better winning odds by betting on a 6 or an 8 than betting on a 5 or a 9. In turn, betting on a 5 or a 9 is a much better way to go than making a bet on a 4 or a 10. The probability of the dice outcome is what makes a bet either good or bad. The rules page defines the smart bets you can place to give you the best craps odds. Take the Hardway Bets, for example. If you don't know what a hardway bet is, it's betting that a particular number (either a 4, 6, 8, or a 10) will come up before a 7, or a soft total of that number does. BUT, the numbers can't be just any old combination: you need two 2's for a hard four, two 3's for a hard six, two 4's for a hard eight, and two 5's for a hard ten. Can you see why these bets are horrible? 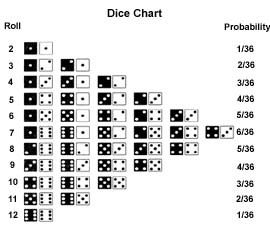 Just looking at the dice chart, you can decide yourself which numbers have a better chance of coming up in a roll, therefore, giving you a better chance of winning in craps. Always keep in mind what the probability of a certain number is when placing a bet. It can make you or break you - that's what gambling life is all about! The following are the craps odds for all the different bets you can make at the table. Each table shows you what the payoffs are and what the house edge is on the particular bet. These bets can be good when betting on the right number. So place the 6 or the 8 only; the rest aren't worth your troubles. I recommend you stick to placing these numbers instead of buying them; the house edge is lower for placing. The house edge is quite high on these bets and the payoff doesn't reflect the true risk of the bets. This is the classic 'sucker bet'. The payoff isn't worth the risk in this case. Place the 6 or the 8 instead; the house edge is much lower and the payoff is better. Although the payoff is quite attractive, don't even go there. The house edge is much too high to allow for many winnings. Play these bets only on occasion for a lark, you might get lucky. Great payoffs - high house edge. The probability of getting any of those numbers on the next roll is pretty low. This bet offers the worst craps odds clear across the table. The house edge is over 16%, and the payoff doesn't even reflect it a 4-to-1. Again, very good payoffs but the odds are very low. Wouldn't recommend any of these.